Kirk Bell March 29, 2019 Comment Now! The Tail of the Dragon sits at, or near, the top of any list of great driving roads in America. This 11-mile ribbon of U.S. Highway 129 between Tennessee and North Carolina entices enthusiasts with more than 300 turns and 1,000 feet of elevation change. Unfortunately, it also attracts Harley-Davidson riders out for a cruise, campers trundling along, and bicycle riders peddling away among the beauty of the Great Smoky Mountains. This glorious stretch of spaghetti asphalt is often cloaked in fog and soaked with rain, especially on early spring days like this. As I approach the Tail of the Dragon from the north on Foothills Parkway Road, the fog is pea-soup thick. It’s so thick that my drive partner, a former racer, pulls out his phone to load the local map and call out the turns for me. Between the weather and the moving obstacles, it looks like my drive in the 2019 Volkswagen Jetta GLI could be a bust. With Highway 129 in sight, the fog parts and there’s not another soul in the area. Time to ride the Dragon. The road is damp but it’s not raining. With trees just off the pavement and steep dropoffs, it’s wise to be cautious, but the GLI offers enough grip in these conditions to have fun, even with its mid-level Hankook tires. I’m in a top-end GLI Autobahn model with a 7-speed dual-clutch automatic transmission, which comes with an $800 upcharge. Even though I’m a big fan of manual transmissions, the dual-clutch gearbox offers little penalty. It provides quick shifts, and drivers can shift for themselves via tiny plastic paddles on the back of the steering wheel. The new 2.0-liter turbo-4 taken from the GTI delivers an obvious increase in grunt over the outgoing engine. The culprit is torque. While the engine is no bigger than the one it replaces, it produces 228 horsepower, 18 more horses than the last 2.0-liter, and 258 pound-feet of torque, a significant increase of 51 lb-ft. That’s probably good enough to get the 0-60 mph time down into the mid-to-low 5-second range, though VW isn’t quoting a time. Every Jetta GLI has a drive mode selector with Eco, Comfort, Normal, and Sport settings. I’m running in Sport, which keeps the engine in its power band above 2,500 rpm by holding a lower gear. That helps it pull out of the corners up this mountain pass in the sprint from one turn to the next. The Sport mode has a drawback, though. VW digitally “enhances” the engine sounds and sends them through a speaker below the dashboard. The Sport setting brings the engine note forward in the cabin. While the GLI sings a pretty good tune for a 4-cylinder, the constant drone in Sport quickly wears thin. 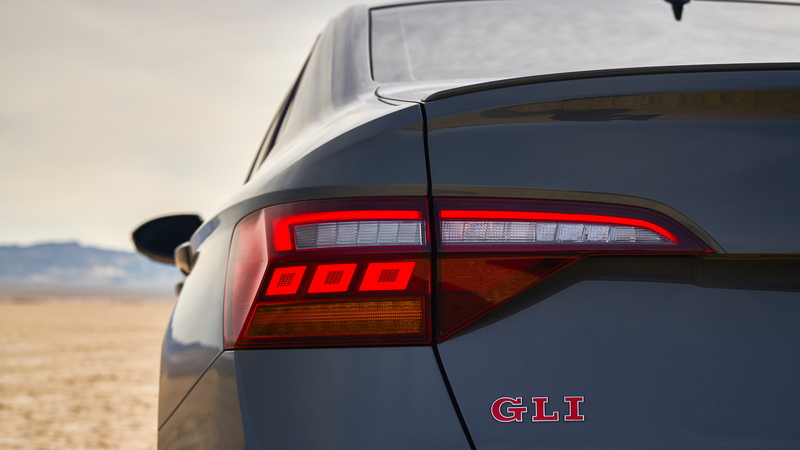 The GLI deftly handles the constant switchbacks, and that’s a tribute to both its MQB architecture and some smart parts-bin raiding on VW’s part. The engine comes from the GTI, and so do the steering rack, limited-slip differential, independent rear suspension, and the available adjustable adaptive dampers. Volkswagen even turned to the Golf R for the GLI’s front brakes. All these changes—except for the dampers—make this a fun drive as the road rises up to meet the sixth-generation GLI. Many of the turns are have a few degrees of camber that help the outside tires dig in for added traction. It would be hard to design a better road for driving fast. 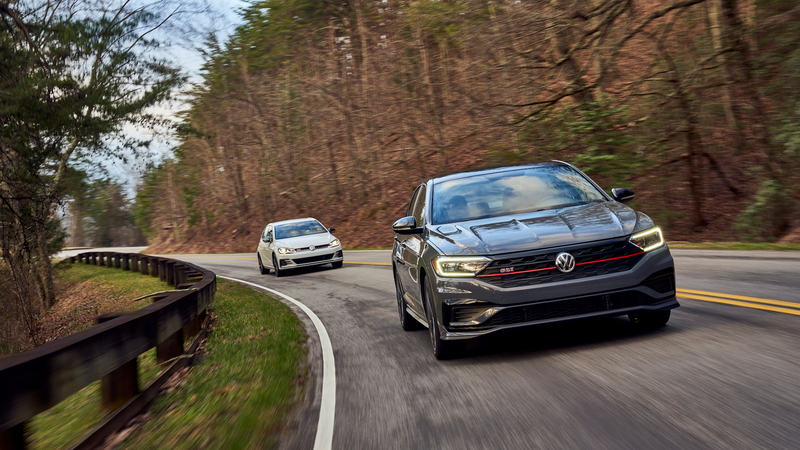 While the GLI sharply turns into the endless string of corners, it’s longer wheelbase makes it less nimble and satisfying than the shorter GTI. That’s OK because the steering is designed for this kind of work. The variable-ratio steering quickens up as the steering wheel is turned farther off center, which means it requires about two turns lock-to-lock in the tight stuff instead of more than four. That prevents a lot of sawing at the wheel. The Sport mode adds some welcome weight as well. VW’s limited-slip front differential is also working overtime. The electronically controlled differential has a clutch that can lock the front wheels together in about a tenth of a second. It can also send the power to the outside wheel in a turn to vector torque and improve handling. In these turns, it prevents the front inside wheel from spinning, pulls the car through corners, and contributes to pleasantly neutral handling. This car has the standard dampers, which are tuned for a firmer ride that is reminiscent of the GTI. They help the driver feel the road better, but they may make the ride too stiff for some. What I thought was going to be a foggy drive ruined by dawdling Harley riders turns out to be a clear shot without another vehicle in sight for the whole 11 miles. That puts the vented 13.4-inch front brakes to the test. They heat up and I can smell them, but they never fade. Highway 129 isn’t the only good road around these parts. U.S. Highway 143 through the Joyce Kilmer National Forest is another fun drive, and for this one a 35th Anniversary GLI with a manual transmission and adaptive dampers is calling my name. This road isn’t as smooth as the Dragon, and Sport mode shows that the adjustable dampers become firmer in the Sport setting than the base suspension. That leads to some skidding over patched pavement, but switching to Normal mode creates a smoother ride that keeps the tires on the pavement and enhances grip. I play with the drive mode controller’s Custom setting and choose Normal for the dampers, engine sound, and climate control, and Sport for the steering, differential, and engine/transmission. That setup gives me a car with a smooth but still sporty ride and a relaxed engine note but an aggressive throttle. I also appreciate the slick shifter in this car. It offers short, positive throws that slide dutifully into gear, and a natural clutch take-up. It can be hard to get underway on an incline, though. It requires goosing the throttle to get the revs up to avoid stalling the engine. The rest of the GLI is either standard Jetta or cosmetic. The exterior changes add an element of sportiness to a car that is otherwise rather vanilla. Up front, it has a honeycomb grille with a red stripe inspired by the GTI. The front and rear bumpers attempt a meaner grin, side skirts help lower the car further, beyond its 0.6-inch drop compared to the standard Jetta. 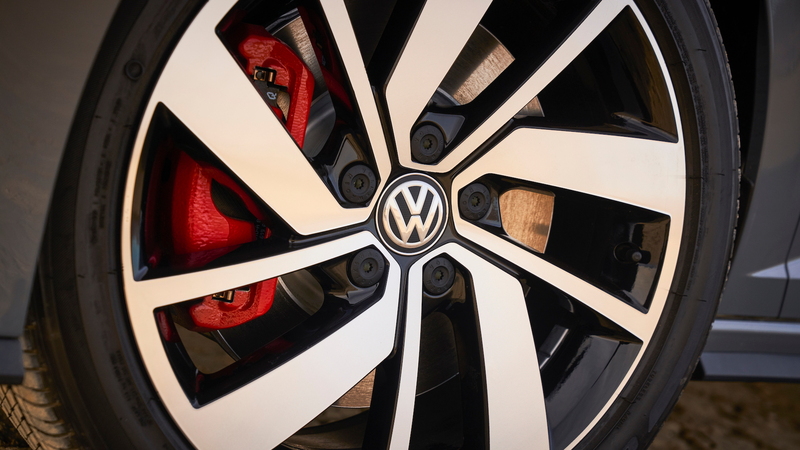 Red brake calipers sit behind the 18-inch wheels for a final sporty touch. Inside, the GLI gets red accents and a smattering of comfort features. VW offers base S, 35th Anniversary, and Autobahn models. All have heated front seats, dual-zone automatic climate control, and a center touchscreen 6.5 inches across, or bigger. 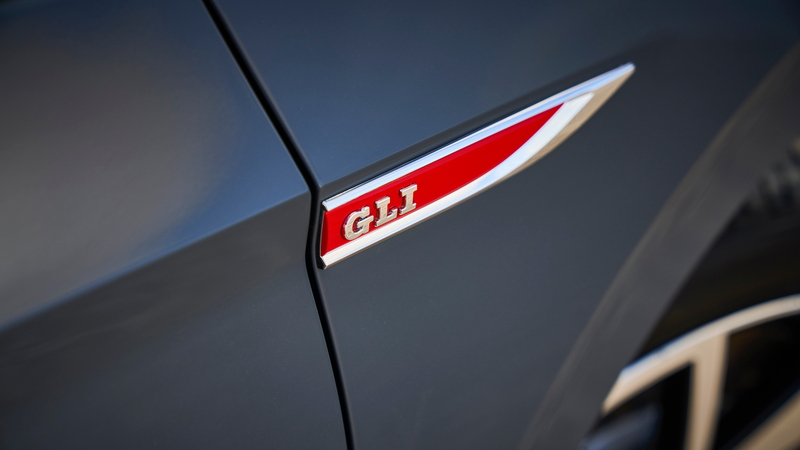 All GLIs also come with forward-collision warnings with automatic emergency braking, blind-spot monitors, and rear cross-traffic alerts. All that for $26,890 to start. I recommend the 35th Anniversary model for $1,000 more, though, because its adjustable dampers provide a better ride. Oddly, VW doesn’t offer navigation in any model, though Apple CarPlay and Android Auto compatibilty can handle that duty. The VW Golf GTI is one of my favorite cars because it’s fun to drive, has a practical hatchback body style, and comes at reasonable prices. The 2019 Jetta GLI channels that car better than ever, mostly because parts from the GTI lend a similar character to this sedan. 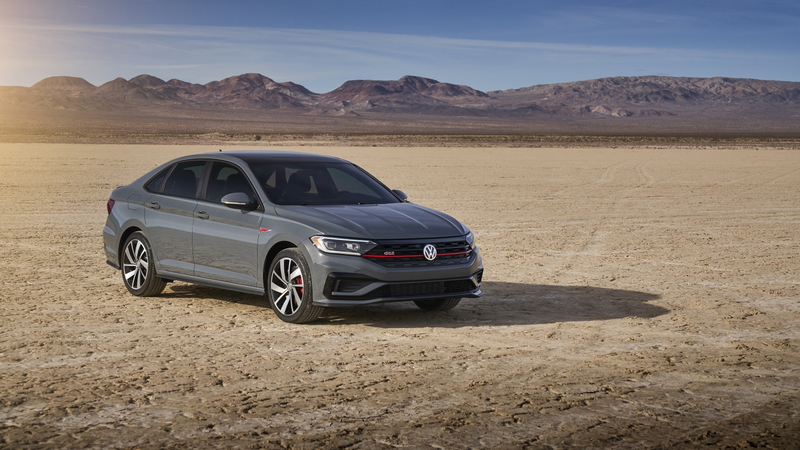 It may not have a rear hatch, but the 2019 Volkswagen Jetta GLI has a large trunk, a useful rear seat, and sporty moves inspired by its beloved cousin. I’m glad there are still cars like the Jetta GLI despite buyers’ preferences for SUVs. Sometimes the fog lifts and the road opens up before you, and that’s where a sport sedan like the Jetta GLI makes all the difference. Volkswagen provided travel and lodging to Internet Brands Automotive to bring you this firsthand report.